1250mm Dia CNC Double Column Vertical Lathe with 60 Tool Changer with Siemens 802 D Control. After acknowledgement of wants and necessities of our clients, we are offering VTL Double Column to the prestigious clients. Bar ejector system in slide. Fly Wheel & Pneumatic Clutch Guard. Electric equipment for 3 phase, 415 volts, 50 cycle A.C.supply. >> Complete Hydraulic power pack unit dully fitted with motor, pump and tank. >> Chuck plate coated with turcite “B guidways. >> Chuck plate with hydrodynamic system. - Highest productivity in this class of vertical machining centers. Double column vertical grinding machine especially designed for large dimension bearings. - Stabilized pearlitic cast iron structure. - Two independent rams mounted in double column structure as an option. - B-Axis with integrated torque motor up to 2 spindles. 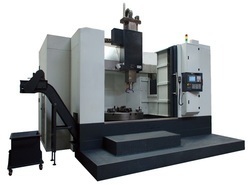 - Hydrostatic rotary table for high stability, vibration absorption and damping capability. 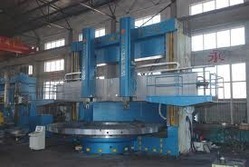 We are trader and supplier of Double Column Vertical Lathes.